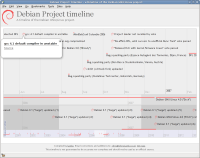 I've put together a partial timeline of the Debian project using the SIMILE Project's DHTML timeline component. The timeline is available to view here. March 10, 2008, 9:04 a.m.
That is definitely cool ! That would be great to add links to the html version instead (if available), and to make translation available depending on the accept-language headers.